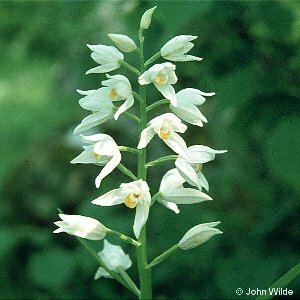 This orchid is called the Narrow-Leaved Helleborine or the Long-Leaved Helleborine and is extinct in Northern Ireland: the photograph was taken in Co. Clare. It was known to occur in damp woodland about the north-east corner of Lough Neagh and Muckamore areas until about 1840. It had also been found in 1694 by William Sherard at Derry Lough near Ballynahinch - one of the earliest records for any plant species in Northern Ireland. 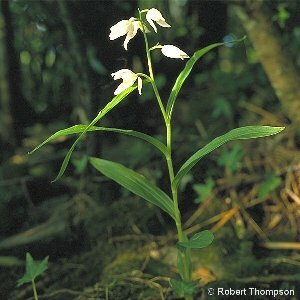 All names: Cephalanthera longifolia (L.) Fritsch; Cephalanthera ensifolia (Schmidt) Rich.